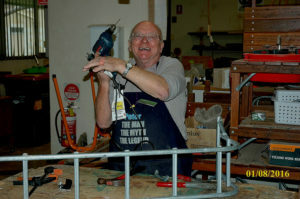 News Archives - Parramatta District Men's Shed Inc. News Archives - Parramatta District Men's Shed Inc.
Due to unprecedented request our shed is now opening on Fridays from 1000am til 2pm. Our shed is now open 4 days a weeks …. Monday, Wednesday, Friday and Saturday. In May 2018, the Australian Charities and Not-for-profits Commission (ACNC) approved registration of PDMSInc as a Charity . 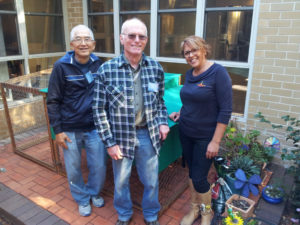 The registration of PDMS as a Charity recognises its role in the Parramatta Community and its contribution to the “Public good”. “A very big thank you to the Acre Consulting team who worked on our submission for registration and dealing directly with ACNC on our behalf. 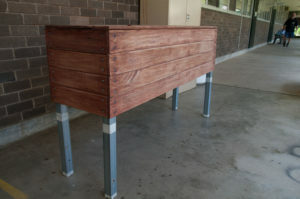 This was quite a big project for PDMS and included changing our Constitution to meet ACNC’s registration requirements. Acre Consulting has partnered with PDMS since its formation in 2012 and has advised on Strategic and Business Planning processes and implementation, as well as advising the PDMS Board on specific projects. 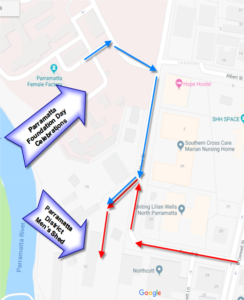 We invite you to join us for a rare opportunity to learn about the history of the Parramatta North Heritage Precinct. On Saturday, 19 May, there will be tours of the grounds throughout the day, and an opportunity to peek inside some of the heritage buildings that are not normally open to the public. Heritage and archaeology specialists will be on hand, and there will be displays of information, as well as historic images and videos. Meg and Tom Keneally about writing “The Female Factory”. Historian Dr Terry Smith, “From Female Factory to Public Asylum”. 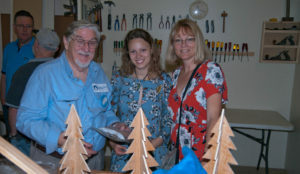 Peek inside buildings and learn about the recent repair works. See artefacts discovered during recent archaeological investigations. Norma Parker Centre (former Orphanage / Parramatta Industrial School for Girls). 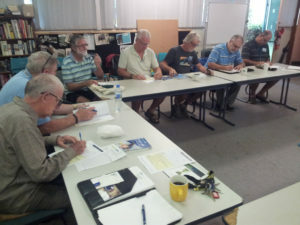 Members of Parramatta District Mens Shed successfully completed the Provide First Aid HLTAID003 course delivered through the Michael Hughes Foundation (MHF). 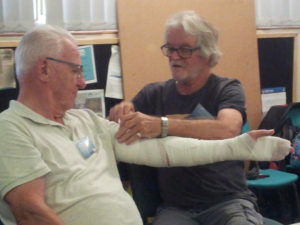 Our course presenter Kevin McSweeney instructed 14 PDMSInc members and 1 non member (through MHF) in the art of first aid. 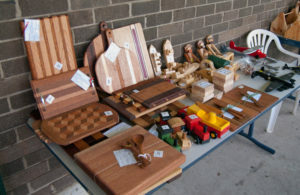 Kevin’s style was relaxed with a lot of personal experiences weaved into the instruction. 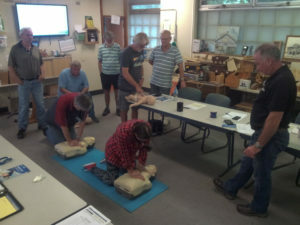 This provided some very good context as to why First Aid is such an essential component for first responders / “good Samaritans” It also highlighted the need for these skills in all Mens Sheds. 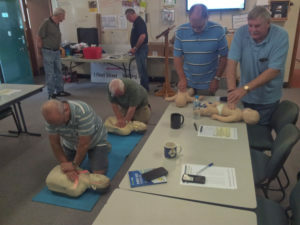 The course include CPR and AED (Defibrillators). 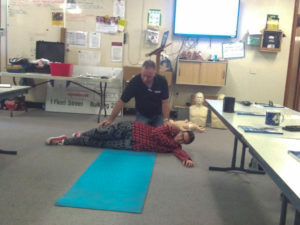 CPR practice …. really exhausting!!!! After lunch our participants were introduced to other First Aid activity, including what to do in case of snake and insect bites, scalding and electrical shocks. 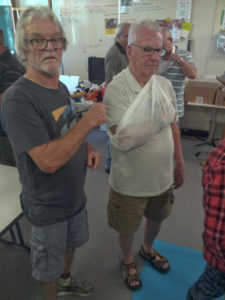 Of course then came the mandatory use of bandages and slings for immobilizing fractured limbs …… some of the participants really took advantage of this session to have a LOT of fun and some joking around!!!!!! now it’s your turn …..
told you not to fool around…..
Now we are getting serious … Right??? Men Care Too …. new website just launched …. The caring experience and perspective is often different for men. We generally find it difficult to ask for help and it is hard finding somewhere to fit in as a man with caring responsibilities. 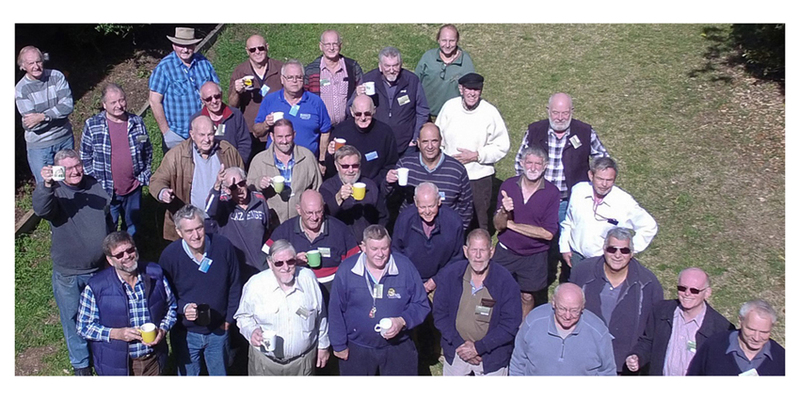 The Men Care Too website is for Sons, Brothers, Fathers, Uncles, Husbands, Neighbours and Mates. 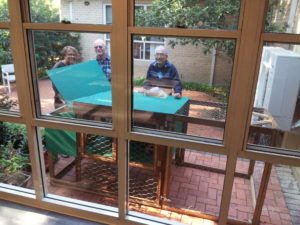 They are all helping someone they care about who may have a disability, mental illness, chronic condition, terminal illness, alcohol or other drug issue or who are aged. 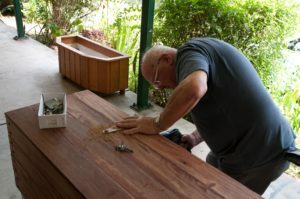 Men Care Too is also a reminder for service providers, community groups, organisations and employers to include men in conversations about informal, unpaid caring roles. 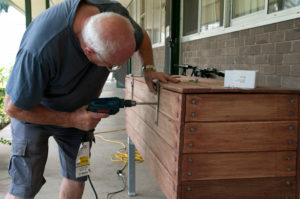 Men Care Too has three focus areas – Awareness, Wellbeing and Engagement which you can read more about here. Through sharing of relevant information, links and videos along with regular blog posts, Men Care Too will increase awareness and recognition of men in unpaid, informal caring roles. Men Care Too Monday features news and updates about men in the caring role, delivered free every week. Subscribe here. Please share this simple message Men Care Too and help show the 1.2 million Australian men in caring roles that they matter. 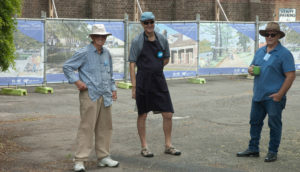 PdmsInc has been successful in winning some grant monies from Parramatta City Council (Community capacity building) for the development of a pilot program to develop heritage skill sets required in the Parramatta North Urban Transformation project area. The executive of PDMSInc realised that here is a massive skills shortage for heritage restoration and in particular for brick pointing and sash window repair. 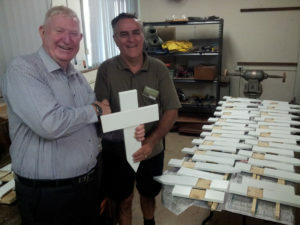 Over several months of meetings and discussions we are now well advanced in forming a collaboration with TAFE, Parramatta Skills Exchange to develop a program of providing initial training of local youth in these skills. 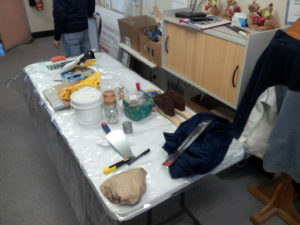 The concept is that TAFE will source the youth and provide education in on-site safety and basic tool use. This training will be nationally accredited so the youth actually walk away with some skill sets to make them more employable. 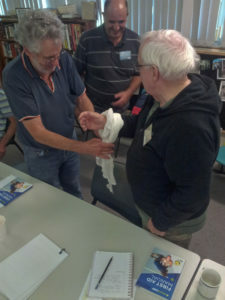 So our men met on Tuesday 4th July with Mr Donald Elsmore (Heritage Architect and convenor of the Australasia Chapter for the Association for Preservation Technology International (APT)) for the first installment of getting our volunteers ready as mentors and trainers in the basics of heritage brick pointing and sash window repair. 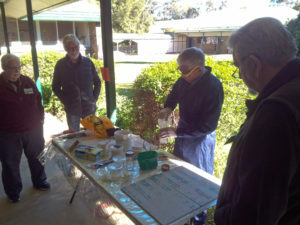 Donald provided our members with a very detailed and interesting history of lime used as cement and why it is so important to use original techniques in modern day repair work of heritage buidlings. All of our volunteers also looked on as Donald showed how lime is prepared for use as mortar and we then examined a small section of brick wall to see first hand the deterioration and type of repair needed. 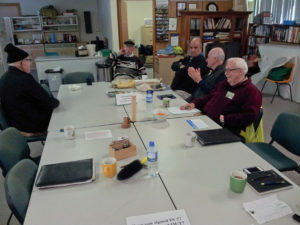 Our shed is getting close to completing a pilot program with TAFE and PSE with our first focus on providing some community based enlightenment sessions on the importance of heritage repair. 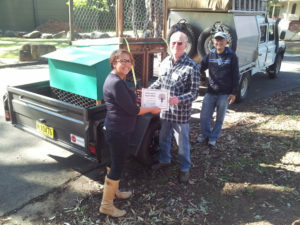 THANK YOU PCC for enabling our shed to start such important community work.